There are a lot of things to consider when deciding where to build a new project, or how to develop a plot of land. We all want win-wins for construction costs, future revenue, recreation and environmental impact, but how do we find those win-win situations? What methods can we use that account for multiple objectives over the long term while developing our land resources? Join us July 25 for an interactive webinar that will address these issues and more. 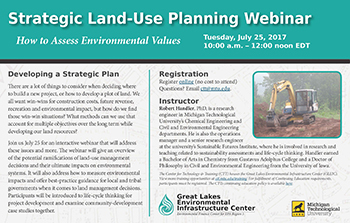 The webinar will give an overview of the potential ramifications of land-use management decisions and their ultimate impacts on environmental systems. It will also address how to measure environmental impacts and offer best-practice guidance for local and tribal governments when it comes to land management decisions. Robert Handler, PhD, an operations manager and senior research engineer at Michigan Technological University's Sustainable Futures Institute, will introduce participants to life-cycle thinking for project development and will examine community-development case studies with participants. ​Please refer to the GLEIC Continuing Education Policy for information on using GLEIC training sessions for professional engineering license continuing education requirements.